With the massive wild fires, and uncontrollable pests, weather related anomalies, our national forest have never been at greater risk of catastrophic decline. Our forests are in need of help as many areas have been so severely burned and millions of acres have been destroyed. Besides their beauty, these forests provide wood for our homes, clean air and clean water for millions of American cities. WATCH:> Arbor Day Foundation public sevice announcement video on Replanting Our National Forests. These forests are our future and replanting them is critical and it's our topic on this week's #treechat! Join @CoronaTools and #treechat co-partner, Coe Roberts, social media specialist at Arbor Day Foundation, @ArborDay for this week's topic, replanting our national forests. The live chat begins Tuesday, June 3, 2014 at 11 a.m. PST / 2 p.m. EST. 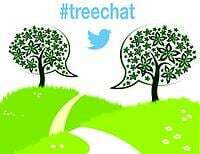 This the Twitter chat were we come together with industry experts and fellow tree tweeps each week to discuss all things related to trees and tree care, since 2010! The State of Our National Forests - Discover the latest on the condition of our national forests in the wake of wild fires, pests and weather. Wild Fires Take Their Toll - Learn how wild fires get started and wipe out millions of our national forests each year. Why Replanting Is Critical - Understand why reforestation is so important and affects us all. Replanting These Nationals Treasures - Hear about the efforts it takes to to reforest our magnificent forests. Replanting Programs Abroad - Explore Arbor Day Foundation's activities abroad and making reforestation a global effort. Join us for this information-rich topic live on Twitter! Just sign in, search for #treechat and tweet using the hashtag. You're tweets will appear in the live tweet stream and you will be part of the conversation. This topic is as hot as the fires destroying our trees and so important for people to learn about what's being done to replant our national forests. It will be an hour packed with information and insight on why we should all be concerned about restoring them. Come and join us!